When Ana Rivero Rossi yells “go,” Todd Hanson darts out into traffic clutching a pair of hand-painted hearts tied together by a shoelace. With a flick of his wrist he heaves the hearts into the sky and watches as they soar through the air, full of possibilities. Or not. They drop to the street with a thump. He picks them up and heaves again. It takes more than a few tries, but he gets them where he wants them: dangling from the telephone wires that stretch across 15th Street. When the hearts begin to swing, Rossi and the crowd that has gathered to watch begin to cheer. 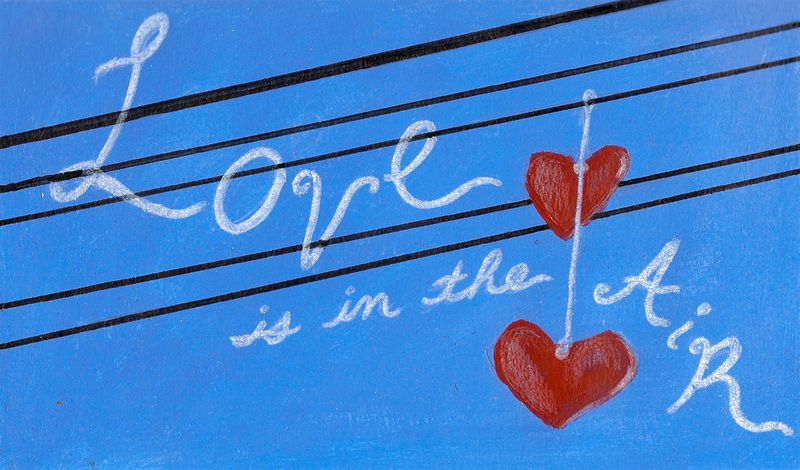 The artists, who have been throwing hearts over wires around the city since October for a project they call “Love Aqui,” can rest assured that there is now an abundance of something in the air in this little pocket of the Mission. It started in April of last year, when Rossi was crafting magnetic hearts and giving them away to people she felt a connection to. But the idea for the dangling hearts grew out of her curiosity about sneakers hanging from telephone wires. Originally from Spain, she often wondered about the story behind the American phenomenon. The urban myths she heard were about drugs, gangs, violence or claiming streets. She realized that the act of throwing sneakers over wires was an urban language. But it was a language that had come from a low, dark place. It was then that she decided to use hearts as a universal sign of love, to speak a language that’s about love. Rossi began making pairs of hearts out of old, flat air mattresses, painting them red and tying them together with shoelaces. For months, stacks of them sat in her studio at Art Explosion, waiting to be flung into the air. Around the same time, Hanson was working on his own project about love. Encouraging people to stop and take a moment to acknowledge the love that they feel in their lives, he documented everything passersby wrote on airline baggage tags tied to a fence on Valencia Street in his “What Do You Love” installation. When Hanson heard about Rossi’s project, he was eager to help. “She needed a conspirator,” he says. He was already familiar with the language of sneakers over wires, and had been doing his own art in response to it. His stencil of a pair of untied sneakers that can be seen around the Mission urges viewers to question where the sneakers have come from. “Have they just fallen off the wire?” he asks. And so, Hanson says, it was sort of fate that brought the two artists together to speak a new language in the streets. They began producing the hearts at his cottage in Noe Valley, where pieces of airless mattresses, grommets and grommet tools, a stapler, a hammer and a hot glue gun are scattered on an oriental rug. The process involves cutting the mattresses into heart shapes, stapling the shapes together, stuffing them with whatever they can find to weigh them down, hammering grommets into them, sealing them, painting them, waiting for layers of paint to dry, shellacking them and tying them together. And then comes the distribution — sometimes during the day, sometimes at night. Rossi and Hanson ride their bikes around the city looking for areas where they feel the hearts are energetically needed. Often it takes 45 minutes or more. It’s hard to explain, Hanson says. But when they come across the right spot for a pair of hearts, they know it. “It just feels like it needs some love,” he says. People who have stumbled upon a toss have yelled things from cars, beeped horns and jumped off of bikes to be part of the excitement. They watch, wait, hold their breath, clap and laugh. They cheer when Hanson hooks the hearts on the wire and moan when he misses. Many people thank them for doing the project, and some even ask if they can give it a try. To which Hanson happily hands over the hearts. So far, “Love Aqui” has spread across San Francisco and, through pairs of hearts given to friends, as far as New York, Mexico and Paris. As for the future of the project, Hanson and Rossi say they’re not sure where it’s going, but they’ll find out along the way. For now, they’ll keep heaving their hearts into the sky, hoping that more and more people begin to speak their language. I’ve been throwing old sneakers up onto telephone wires since I was a kid. It’s something kids do, nothing to do with marking gang territory. How is this not littering or something? Ana I’m so proud of you!! This is a really terrific project and it fits both your spirit and this moment in time!! Congratulations on an amazing endeavor!!! QUE LINDO PROYECTO ANITA! CONGRATULATIONS! QUE EL AMOR SE CONTINUE DIFUNDIENDO POR EL MUNDO!